My adorable son giving it a try! Wow... wow... like seriously, wow. When my gratis sleeper arrived from the UPS guy, I opened it quickly and boom- my jaw dropped!!! This has to be one of the coolest things I've ever reviewed!! The theory behind this product is that moms can enjoy some quiet, calm, stress-free time while baby naps near them in plain view. 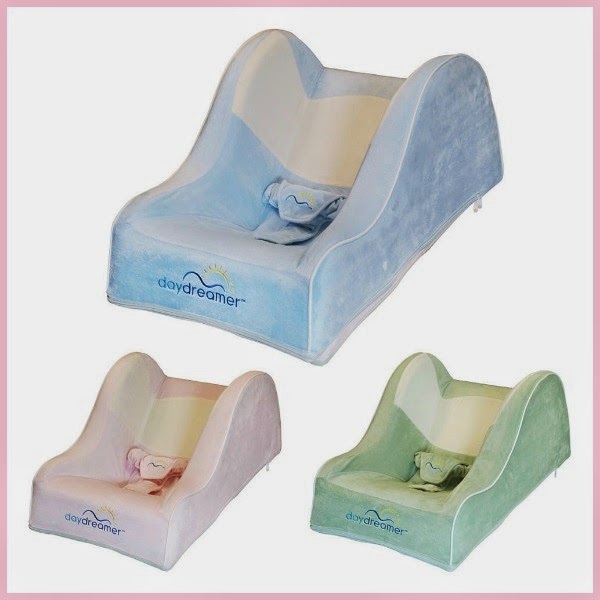 Baby gets to enjoy the super soft, safe comfort that the DayDreamer offers! By being able to keep an eye on baby, there's no need for the annoying fuzz of the monitor or constantly looking at the camera (if you have one) to see if baby is moving around. This provides extremely safe and effective sleep time! The fabric is heavenly soft. It's that silky kind of plush feel that feels smooth and fantastic. I have a throw like it and my kids each have full size blankets with the material, so clearly it's a great feeling to have surrounding you, well, your lucky baby. The DayDreamer comes in 3 colors. "Busy moms everywhere can now give their babies the benefits of soft, snug, perfectly-inclined sleep anywhere with the DayDreamer Sleeper. Designed by an infant product specialist and 20 years in the making, DayDreamer’s innovative features include a 28-degree incline that provides a perfect, restful position with a soft, breathable cover that prevents baby from overheating. Fully-compliant with federal law and Consumer Products Safety Council proposed standards, the DayDreamer Sleeper features a flat base and high sidewalls that offer maximum stability and protection. The DayDreamer is also doctor-endorsed: “I would definitely recommend [the DayDreamer Sleeper] to new parents. I suggest infants sleep at an incline to help prevent plagiocephaly (flat head syndrome) as well as alleviate reflux, congestion and colic symptoms” – Dr. Jamison Foster, General Surgeon." I can't recommend this enough! It may seem like it is a bit on the pricey side, but for the months of use you can get out of it and the peace of mind of having your baby in full view during nap time is totally worth it! Gift idea: Is Your Dad Your Hero?